In the previous release, ZenHub Enterprise 2&period;18, we introduced access to ZenHub web and mobile in an early access preview. We are proud to now officially launch web and mobile access with 2.20! We've addressed outstanding issues, improved the interface, and introduced enhancements to make the web and mobile experience better. 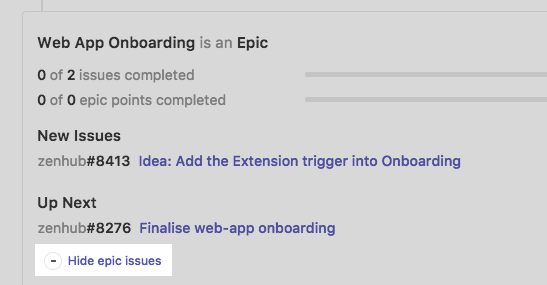 Multi-repo Boards can now be created across both the web app and extension. Markdown support has been extended to clickable checklists. File and image uploads are now supported across all Issues, either added via the UI or by copying and pasting into a comment. The file size limit is 10MB. Issues can now be cross-referenced, using the νm; sign and Issue number. If you are part of more than 1200 repositories in a GitHub organization, significant performance updates have been made to load your repositories faster. Issue events are collapsed in Issues by default to save space between comments within the Issue. The three most recent events will appear. Across both the ZenHub Enterprise extension, and the web application, we've made enhancements to multi-action, Epics, and dependencies. In the ZenHub web app, you can now collapse the Epic section at the top of the Issue. Collapsing the Epic section will hide the complete list of Issues. The progress bar will remain at the top of the Issue, so you will still see overall how the Epic is progressing. Issues can now be closed in bulk using multi-action. 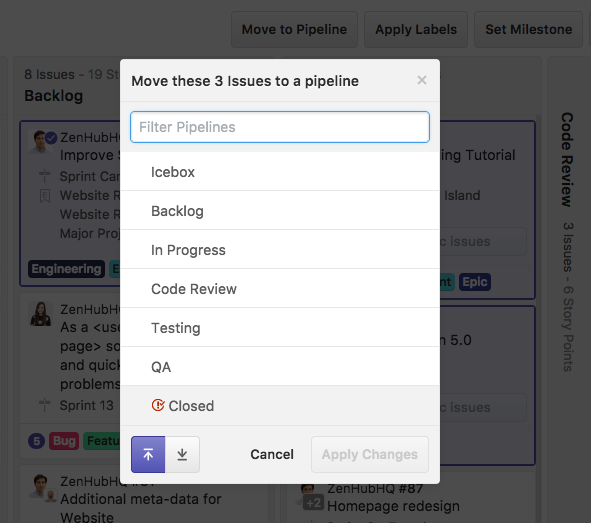 Once in multi-action mode, close Issues in bulk by selecting Move to Pipeline then select the Closed pipeline. This will automatically close out the selected Issues. In addition to the bug fixes and enhancements listed above, we've made improvements for administrators. Below is a list of important updates for administrators managing the ZenHub Enterprise appliance. API Rate Limits&colon; GitHub Enterprise 2.10 allows admins to configure the API rate limits. We recommend not enabling the API rate limits, or if you're modifying them, to set them to a minimum of 5,000 requests per hour. ZenHub Enterprie File and Image Uploads&colon; This release includes file and image upload support for Enterprise (part of the ZenHub web application). In order to be able to uploaded files and images on the ZenHub Enterprise instance, please ensure you have at a minimum 30 GB of free disk space. Security Updates&colon; We have upgraded our Node version to 6.11.1 to address a security issue on the 6.10 version. For further details, please see the NodeJS blog here. Firefox Browser Support&colon; This is the last ZenHub Enterprise release that supports Firefox browser versions that don't have multi-process. Our next release, 2.22, will require Firefox 52 or above. This will allow introducing Firefox Multi-Process support and Web-Extensions. Changing the ZenHub Enterprise hostname&colon; Webhooks need to be reset if the hostname of the ZenHub Enterprise instance changes. Please contact support if you need to make any changes to your hostname to get support resetting Webhooks.